3 1/8" Vintage R.A.F. Avro Vulcan B2A Servo Altimeter indicator. Manufactured by Smiths. P/N WL/139 AM/PC. Very clean item. It shows very well and it would make an excellent bookshelf item for the office or home or just as a mock up panel instrument. Glass face is cracked on bottom, see photo. Replacement 1/8" thick glass face, P/N FSN-KZ-5355-538-6382 is included as shown on photo. Sold as is, no returns. 3 1/8" Vintage R.A.F. 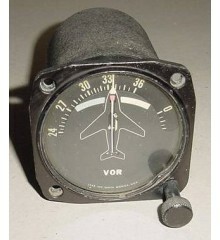 Avro Vulcan B2A Servo Altimeter indicator. Manufactured by Smiths. P/N WL/139 AM/PC. Very clean item. It shows very well and it would make an excellent bookshelf item for the office or home or just as a mock up panel instrument. Glass face is cracked on b..